Watagal hill is tadpole shaped when seen from air. Watagal hill is located in the black soil plains of Raichur district. The hill resembles a heap of boulders, there's no similar hill in the vicinity, the next nearest such a hill is at Anegundi in Koppal district. Watagal hill is a natural fort; it has a clearing on the top which can be approached by a narrow path. 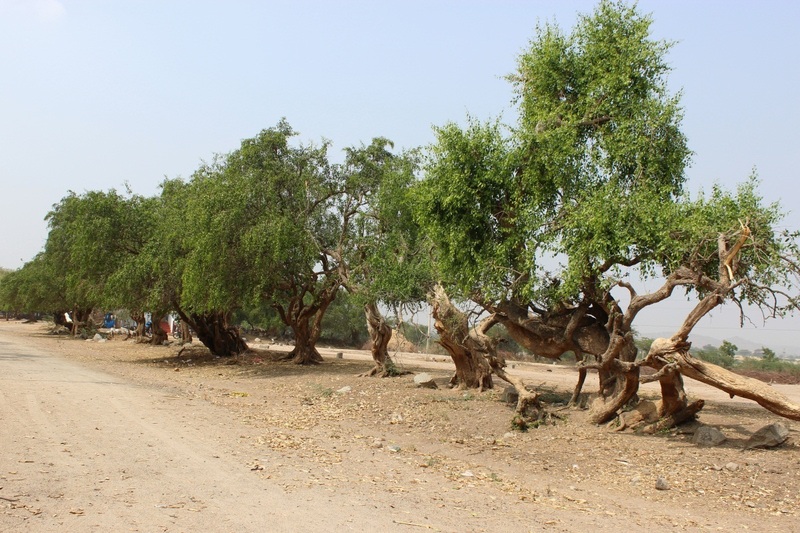 Watagal is a known to be a prehistoric site. Neolithic grey ware, Brahmagiri fabric and Jorwe fabric has been found during archaeological excavations here. Watagal, in the surrounding area is known for its Basaveshwara Gudi, a shrine dedicated to Lord Shiva's mount Basava ~ Nandi. The temple is situated close to the hill's western tip, on the northern side. After finishing our tour of Watagal hill. Pushpa and I bid bye to our guide Mahantesh. He suggested us to stop at Basavanna temple, said its a nice peaceful place. We said we will. The dirt road towards the temple was lined with a row of trees.. each of the trees' trunks and branches are twisted and ribbed.. as though they are very aged. The twisted trees avenue. 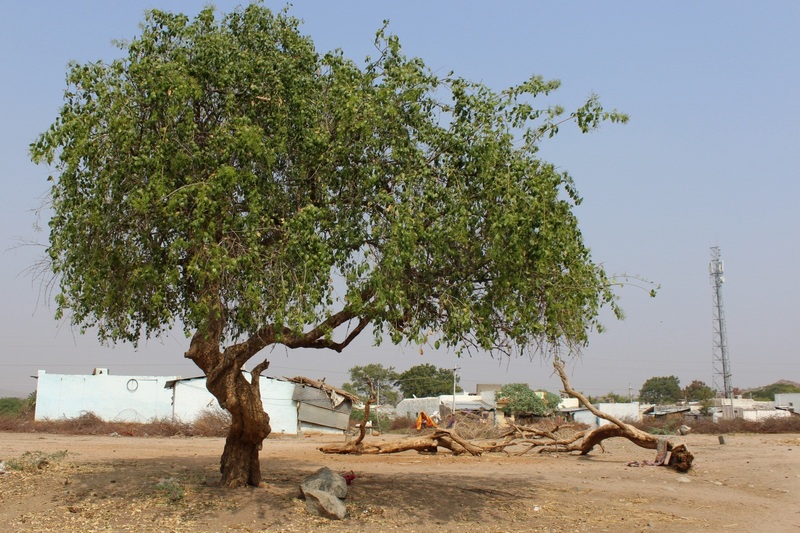 In north Karnataka, usually in temples where annual fairs are held, trees can be seen. The purpose of planting trees is obvious.. to provide shelter for visitors. In olden days, kings built stone shelters and wells; in the recent past years trees are the cheaper and easier alternate. I did not take many pictures of the temple; the camera was with Pushpa who decided to stay outside and explore the surroundings. A bunch of kids from the village had followed us from the village were her company. Here's a short video of the temple.. 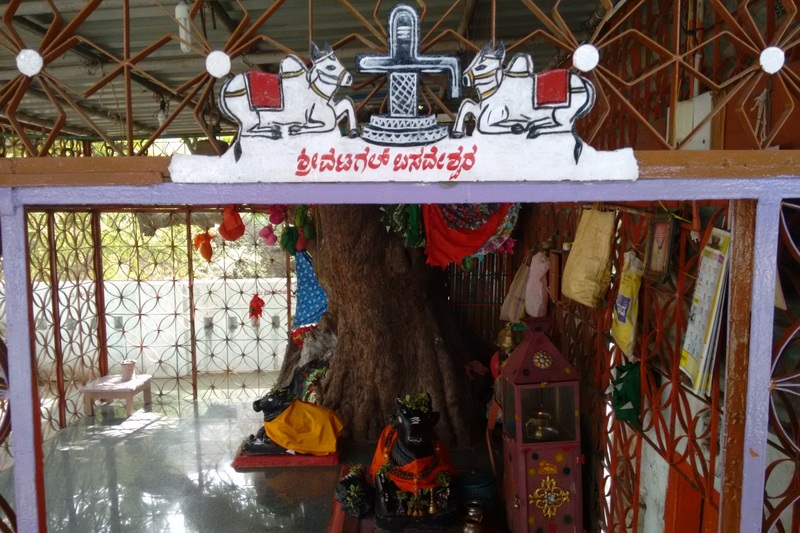 This an open temple with the main shrine being a Neem tree. 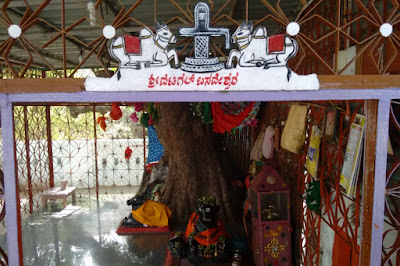 The shrine is protected by a fabricated metal cage and at its entrance is a metal art work.. Shiva Linga flanked by a pair of Basavanna. 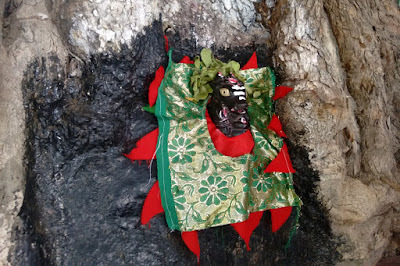 The deity is Lord Shiva's mount Basavnna. The main deity is embedded in Neem tree trunk. My guess is that this shrine is in memory of a pair of bulls. In most parts of India, in the farming community, bulls are considered as family members. Today things are different but years ago bulls were no different from humans in farmers homes. In North Karnataka, when a bull died it was given a proper burial, just like a human being. 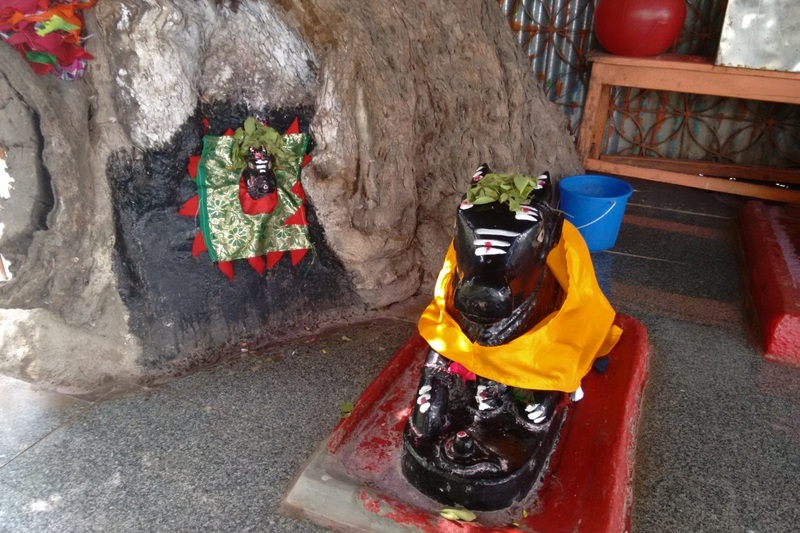 So my guess is this shrine is a tomb of pair of bulls. 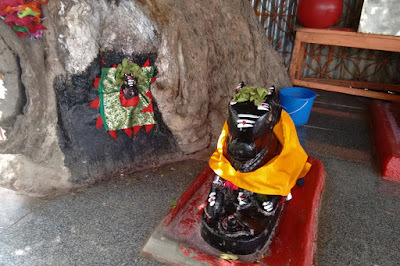 Close view of the main deity.. 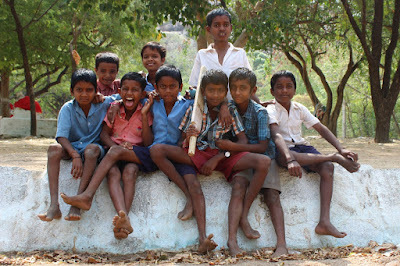 While I was at temple, Pushpa was busy taking pictures of the kids, here are few of them. This boy was the first one we met, as we spoke two more joined in, three close friends. This boy testing his strength.. trying to lift a gundu. 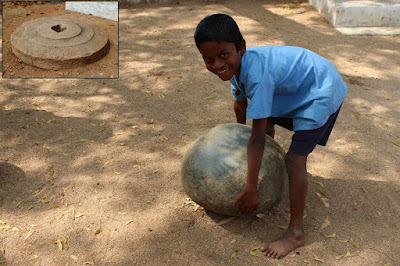 Every village has such stones which were used by kusti jatti.. the wrestlers. 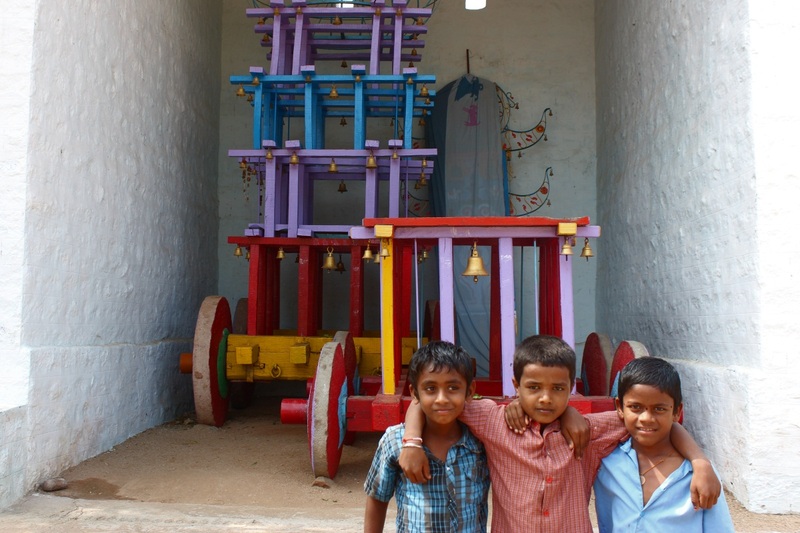 The three thick friends posing in front of the temple's theru. The kids were getting noisier with every passing minute, was too much for Pushpa, Time to leave, we were hungry and tired. The nearest place for lunch was Lingsugur which was 30 minutes drive.